When I copied the Big Daddy comic for people to see, I wanted to write a rebuttal covering the claims that were made in the comic. Some I hadn't heard before, but thought it was necessary, in case someone was curious about them, and to stop anyone in their tracks who might try to use some of those claims against me in a debate. Some of them were already covered in my paper so I won't comment on them again. The format of this paper is the same as my Evidence Bible review. 1. It's claimed that "It has never been against the law to teach the bible or creation in public schools." Wrong. I found online a court decision from 1977, ruling that a creation textbook, Biology: A Search for Order in Complexity, is illegal. This is just one court case though the years in which creationists have tried to get creationism (intelligent design) taught in schools. Hendren v. Campbell was a 1977 state court ruling on the constitutionality of using the creationist textbook Biology: A Search for Order in Complexity in public school biology classes. Biology was produced by the Creation Research Society in 1970 and several controversies regarding its usage in public schools occurred in the 1970s, until the Hendren decision more or less dissuaded further attempts. The judge in Hendren ruled unambiguously that creationism was a specific sectarian religious view, and that the various attempts to disguise it as "science" for the purposes of use in public schools -- a trend already quite obvious in the 1970s -- were a sham. Judge Dugan wrote, "The question is whether a text obviously designed to present only the view of Biblical Creationism in a favorable light is constitutionally acceptable in the public schools of Indiana. Two hundred years of constitutional government demand that the answer be no." Being a state court decision, Hendren was soon obscured by the much more famous federal court cases McLean v. Arkansas and Edwards v. Aguillard. However, given the recent attention paid to the "intelligent design" textbook Of Pandas and People in the Kitzmiller v. Dover case, it is worthwhile to examine the very similar themes apparent in this case from almost 30 years ago. Biology: A Search for Order in Complexity and the Hendren decision are discussed in Ed Larson's (2003) book Trial and Error, pp. 134-135 and 144-146, in the context of the overall legal history of creationism. The Hendren decision was also discussed in a 1980 article in Creation/Evolution by Fred Edwords, and William Thwaites reviewed Biology in the same issue. Creationists discussed the Hendren decision in a 1977 issue of the journal Origins, a creationist publication run by Seventh-Day Adventists. A second, revised edition of Biology: A Search for Order in Complexity was published in 2004. The new edition is in color and again promotes the young-earth creationist view. It appears to be aimed primarily at the home school market. A copy of the Hendren opinion was discoved in the National Center for Science Education archives. The copy is legible but is obviously itself a second or third generation xerox. It was scanned and OCRed, and then the resulting ASCII text was manually edited to put in matching HTML formatting and correct the obvious OCR errors. The text was then run through a spellcheck in Microsoft Word, which caught most of the remaining errors. However, some minor OCR errors may remain. The original document was obviously typed on a typewriter, perhaps by a court clerk or secretary. It therefore contains a fair number of typos and dropped words. Typos or other errors found in the original document have been marked with [sic] or comments in square brackets. The original decision contains no "sic" marks whatsoever, in quoted passages or otherwise. They have all been added in the HTML edit. Therefore any typos found in quotes of creationist works could well have been introduced during the writing or typing of the opinion, and might not be found in the original creationist work. Anyone wishing to cite these quotes should therefore look up the original creationist publication. John N Moore, Harold Schultz Slusher, and the Creation Research Society Textbook Committee (1970). Biology: A Search For Order In Complexity. Grand Rapids: Zondervan Publishing House. Leslie MacKenzie, David K. Arwine, Edward J. Shewan, and Michael J. McHugh, editors. (2004). Biology: A Search For Order In Complexity, 2nd edition. Arlington Heights, Ill.: Christian Liberty Press. Katherine Ching (1977). "Biology Book Battles." Origins 4(1):46-49 (1977). Frederick Edwords (1980). "Why Creationism Should Not be Taught as Science". Creation/Evolution, 1(1), Summer 1980. Edward J. Larson (2003). Trial and Error: The American Controversy Over Creation and Evolution, New York: Oxford Universtity Press, USA. William Thwaites (1980). "Book Review - Biology: A Search for Order in Complexity". Creation/Evolution, 1(1), Summer 1980. Before the Court is a Verified Petition for Review (Amended Complaint) filed on March 23, 1977 on behalf of a ninth grade student, Jon Hendren, his father and another parent of a student in the West Clark Community School Corporation. The defendants are members of the Indiana Textbook Commission. The Textbook Commission is responsible for the adoption of textbooks to be used in the public schools of Indiana. In the general area of biology the Commission adopted seven books, including the one at issue. From that list local school boards may then adopted texts to be used for a period of five years. Five school systems co-adopted this text with another text. 1. Two systems, West Clark Community Schools and South Ripley Community Schools adopted only A Search for Order in Complexity. In all of these systems the text is in current use in the first year of the five year cycle. "The Commission on textbook adoptions shall not approve a textbook which contains anything of a partisan or sectarian character". 1. Was the finding of the Commission arbitrary, capricious, or an abuse of discretion or not otherwise in accordance with the law because it violates statuatory or constitutional prohibitions? 2. Were the findings of the Commission supported by substantial evidence at the administrative hearing? 3. Does the textbook violate statuatory and constitutional guarantees and prohibitions? At the hearing of the Commission, the Plaintiffs called ten witnesses, among them being biologists and theologians. The Attorney General called one witness, one of the authors of the text. All of the Plaintiff's witnesses complained that the book was "sectarian" in viewpoint. One witness, Dr. Jon R. Hendix, was also a member of the State Science Advisory Committee that wrote guidelines for science instruction for the State of Indiana. Dr. Hendix testified that the book was outside of state guidelines. The witness had recommended disapproval of the book. The witness for the Attorney General, Dr. Larry G. Butler, was one of the authors of the book. Dr. Butler felt the book was "in accord" with his own Christian perspective.5. A witness for the plaintiff, Donald L. Nead, observed that the main-line Protestant denominations, including Presbyterians, Methodist , United Church of Christ, Christian Church(Deciples [sic] of Christ), and certain elements of the Lutheran's [sic] and American Baptist Convention had not considered the theological basis of the book viable for many years.6. "The Institute for Creation Reasearch [sic] in the research division of the Christian Heritage College, and all of the students in the College are given 90 class hours of instruction in creationism, so that they are all well-equipped to be leaders in the creationist movement in the future."7. In another exhibit, Dr. Tim F. LaHaye, President of Christian Heritage College, discusses "the ministry of the Institute for Creation Research...", it is a .."unique missionary organization...", ".....it has a remarkable evangelistic and spiritual outreach." 8. "We are seeking to inform the public about the latest findings regarding special creation, but we also desire to publish and distribute material which will educate the reader concerning scriptural evidence and religious thought, and which will help build up the body of Christ." 9. "Although a considerable part of ICR's activity is aimed at the restoration of creationism in the nation's public schools and state universities, we realize this is difficult to accomplish and is a long-range goal rather than one quickly attainable." "In the public schools, for example, we urge that creationism be taught as an alternative to evolutionism not on a religious basis, but strictly on a scientific basis." "In a private Christian school, however, this neutral approach is neither necessary or desirable. Although students in such schools should be taught about evolution, the cirriculum [sic] should stress throughtout [sic] that creation is the only Biblical position and the only realistic scientific position as well." 10. The textbook A Search for Order in Complexity, of some 595 pages and the Teachers Guide, of some 96 pages, were published in 1974 in revised editions by the Zondervan Publishing House. Distribution and promotion was thereafter done through the Institute for Creation Research. 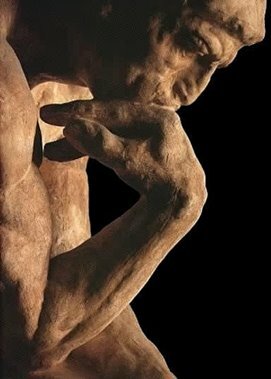 "There are essentially only two philosophic viewpoints of orgins [sic] among modern biologists -the doctrine of evolution and the doctrine of special creation. Proponents of the former postulate the gradual appearance of the various forms of life and of life itself by natural processes over vast ages of time. Exponents of the latter assume the essentially instantaneous origin of life and of the major kinds of living organisms by special creative acts utilized directly by the Creator Himself." "Creation, the sum total of acts by the Creator or Supreme Being who brought into existence the universe, the earth, and a1 life, including mankind that is therein." In fact, the text consistantly [sic] presents creationism in a positive light and evolution in a negative posture. The preface summarizes the program of the text followed in the text itself. "....processes which tend to produce functional similarities...with no 'gaps' of any consequence between adjacent kind; [sic]"
".....processes which tend to produce new entities in an even higher state of order and integration;"
"the inference of a continuous array of such similarities, ...is not supported by the data." "Secondly, study of various processes does bear out the evolutionary inference..."
"Once again, however, this evidence is not very compelling... (and)" seem always to fail in to one, of two categories." (These categories)... "may be used better to support the principles of conservation and decay rather than origination and integration, as proponents of the evolution model would suggest." "...the fossil record does not necessarily reflect slow, uniformitarian evolutionary change over vast ages, but rather contains a graphic record of violence and death on a worldwide scale." "That there was a period of special creation in the past, during which the world was brought into existence out of nothing but the power of the Creator..."
"The features of the creation model are confirmed by most or all of the actual observed phenomena of nature, thus demonstrating the validity of the creation model as being scientifically sound..." "Similarly, the second law (increasing entrophy) [sic] is essentially a confirmation of the universal law of decay and death postulated in accordance with the biblical version of the creation model." "In fact, there seems to be no way of accounting for most of the great fossil beds of the world. ...except in terms of very rapid burial and lithification, such as might be possible, in accordance with the biblical deluge, and accompanying volcanic and tectonic activity and inferred subsequent glaciological phenomena." "On this basis, the creation model is a framework of interpretation and correlation which is at least as satisfactory as the evolution model." "However, (the various principals and laws) all may be correlated far more easily with the creation model than with the evolution model." "Furthermore, the data and principles of physics, chemistry and the other physical sciences are much more esily [sic] understood within the framework of the creation model than in that of the evolution model." "Evidences usually presented in support of evolution as a model of origins are accurately presented and considered. At the same time, it is explicit throughout the text that the most reasonable explanation for the actual facts of biology as they are known scientifically is that of biblical creationism." "We hope this approach will be attractive first of all to the many private schools directed by those seeking to maintain an educational philosophy and methodology consistant [sic] with traditional Christian perspectives. We trust it will also be of interest and use in public school systems by teachers desiring to develop a genuine scientific attitude in their students rather than an artifically [sic] induced evolutionary worldview." Most of the chapters in the text itself deal with non-controversial elements of biological science such as insects, chemical principles, algae, one-celled organisms, and so on. The book is, replete, however, with references to biblical topics, the..."wonderful findings of God's creation" and "divine creation" as being the only correct viewpoint to be considered. Throughout the text, while both viewpoints are mentioned, biblical creation is consistantly [sic] presented as the only correct "scientific" view. Two entire chapters, in fact are devoted to lengthy discussions of the fallacies and weaknesses of the evolution viewpoint. Chapter 21 "weakness of Geoligic [sic] Evidence" goes into great detail disputing evolutionary theories as to fossils and geologic evidence. It explains fossils "....by the fact that most fossil material was laid down by the flood in Noah's time"20 Chapter 24, "Problems for Evolutionists" devotes some eight pages to arguments refuting evolution theory. There are no chapters or passages in the text which deal critically with biblical creationism. Also persuasive as to the avowed purpose of the book is the Teachers Guide. This publication, designed for teacher [sic] in using the text, summarizes the text, offers suggestions for use and enrichment and provides answers to questions found at the end of textbook chapters. These questions are designed to test the student as to his understanding and study of each chapter. A review of some of the questions and corresponding "correct" answers is instructive. "To what extent was Alexander Flemming's [sic] discovery based on chance, and to what extent on training?" "It was 'chance' (under the direction of God's providence) which allowed the penicillian [sic] spores to get into the culture dishes of bacteria..."
"Why does an old human skeleton of low type sometimes receive more attention than an old human skeleton of the same type as living men?" "Some persons believe that evolution has been amply demonstrated to be true. When a skeleton of low type is found, they jump to the conclusion that it is ancestral to modern man. Such persons forget that they are using their assumption of evolution as proof of evolution." "How does the Doctrine of evolution by natural selection explain the development of altruism, or doesn't it?" "If the doctrine of evolution were true, it would favor heartless ruffians such as bandits and weeds. An altrusive [sic] person would be less 'fit' to survive. On the other hand, where a majority of a group of people recognize God, they appreciate and favor the alturistic [sic] person." "Creationists believe there are limits to natural change. 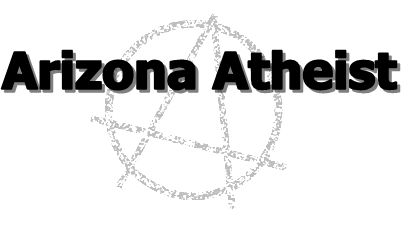 Are they afraid to extrapolate, or are there reasons for such a belief?" "An evolutionist might say, if you recognize small changes, multiply them by the number of years the earth has existed and you will have learned, however, that there are limits beyond which small changes no longer accumulate." "What do hydra, the opossom [sic] and the jack pine teach about development of complexity?" "A complex animal or plant does not, because of its complexity have an advantage in the struggle for existence. Complexity must have been conferred by the Creator rather than by natural conditions such as we observe today." VI. APPLICATION OF STATUATORY AND CONSTITUTIONAL STANDARDS. As a result of the balancing of state and religion throughout this nation's history, courts have also recognized the constitutional rights of individuals to substitute private and parochial schools to exercise dissent and independent views. 28 In fact it is well recognized that parochial schools in our society perform both religious and secular functions. Their right to foster particular religious views is unquestioned. Their obligation to provide secular education regulated by the state is also certain. 29 States may even provide certain benefits to parochial schools such as transportation, books, and allowing students to be released from public school classes to attend religious instruction. 30 These types of benefits have not been held to subvert the prohibition of the First Amendment. 1. The statute must have a secular legislative purpose. 2. The principal or primary effect must be one that neither advances nor inhibits religion. The school board's policy was found to constitute and [sic] unconstitutional preference to one religion over another. The court found that the purpose of a Florida "Christian Virtues" statute was to advance a particular religion. They rejected arguments that the word "Christian" was a mere adjective with little implication as to its application. Finally, the 1975 case of Daniel v. Waters 44 should be viewed with this action. In Daniel a Tennessee statute was examined which required that any textbook expressing an opinion about the origin of man would be prohibited from use unless it specifically stated that the opinion was a theory. The statute also required that the biblical account of creation as set forth in Genesis be printed with commensurate attention and equal emphasis. Lastly, the statute required that biblical creation be printed without a disclaimer that it was a theory not represented by scientific fact. The Court of Appeals found that this statute violated the First Amendment. They found that "the result of this legislation is a clearly defined preferential position for the Biblical version of creation as opposed to any account of the development of man based on scientific research and reasoning." 45 The court argued that teaching and learning cannot be "tailored" to the principles or prohibitions of any religious dogma. Clearly, it is not the function of the courts to determine the validity or fallacy of any religious doctrine. In fact the Judiciary has long had an abborence [sic] to wandering into the thicket of conflicting dogmas and creeds. Personal considerations of the court have no place in the determination of cases of this type. The constitution of the State of Indiana has expressed its confirmation and interpretation of the First Amendment by providing that "no preference shall be given, by law, to any creed, religious society, or mode of worship...". In this case we do not have that situation of an obvious statuatory attempt to impose religious doctrines on the citizens of Indiana. On the contrary, we face a textbook which, on its face, appears to present a balanced view of evolution and Biblical Creation. The record and the text itself do not support this assertion of fairness. Since the Scopes controversy over fifty years ago, the courts of this county have faced repeated attempts by groups of every conceivable persuasion to impose particular standards, whether religious or ethical, on the populace as a whole. We may note that with each new decision of the courts religious proponents have attempted to modify or tailor their approach to active lobbying in state legislatures and agencies. Softening positions and amending language, these groups have, time and again, forced the courts to reassert and redefine the prohibitions of the First Amendment. Despite new and continued attempts by such groups, however, the courts are bound to determine, if possible, the purpose of the approach. Clearly, the purpose of A Search for Order in Complexity is the promotion and inclusion of fundamentalist Christian doctrine in the public schools. The publishers, themselves, admit that this text is designed to find its way into the public schools to stress Biblical Creationism. The court takes no position as to the validity of either evolution or Biblical Creationism. That is not the issue. The question is whether a text obviously designed to present only the view of Biblical Creationism in a favorable light is constitutionally acceptable in the public schools of Indiana. Two hundred years of constitutional government demand that the answer be no. The asserted object of the text to present a balanced or neutral argument is a sham that breaches that "wall of separation" between church and state voiced by Thomas Jefferson. Any doubts of the texts [sic] fairness is dispelled by the demand for "correct" Christian answers demanded by the Teacher's Guide. The prospect of biology teachers and students alike, forced to answer and respond to continued demand for "correct" fundamentalist Christian doctrines, has no place in the public schools. The attempt to present Biblical Creationism as the only accepted scientific theory, while novel, does not rehabilitate the constitutional violation. After consideration of the text and the evidence at the agency hearing, the action of the Indiana State Textbook Commission is untenable. Government cannot be insensitive to the Constitution and statutes of the nation and state. Their approval both advanced particular religious preferences and entangled the state with religion. The decision of the commission is without merit and violative of both statuatory and constitutional provision. 1. The findings of the Indiana Textbook Commission were arbitrary, capricious and an abuse of discretion. 2. The findings were inconsistant [sic] with the evidence at the administrative hearing. 3. The findings of the Commission were in violation with I.C. 1971 20-10.1-9-11; Article 4 of the Constitution of the State of Indiana, and the First Amendment of the Constitution of the United States. 4. The textbook A Search for Order in Complexity, as used in the public schools, violates I.C.1971 20-10-l9-11, Article 1, Section 4 of the Constitution of the State of Indiana, and the First Amendment of the Constitution of the United States. IT IS THEREFORE ORDERED AND ADJUDGED that the findings of the Indiana State Textbook Commission are reversed, and the commission is ordered to make findings not inconsistant [sic] with this decision after re-hearing. 1 Baughgo Community Schools, Union Township Schools, Warsaw Community Community Schools, Morgan School District (Martinsville) , East Washington School Corporation. 2 Boone Co. Rural Elec. Membership Corp. v. Public Serv. Comm'n, 239 Ind 525, 159 N.E. 2d 121 (1959). 3 City of Evansville v. Southern Indiana Gas & Electric Co. [sic should have been underlined], 339 N.E. 2d 562 (Ind. Ct. App. 1975). 13 ID pp 576, 577, 579. 25 Walz v. Tax Commission, 397 U.S. 664, 25 L.Ed. 2d 697, 90 S.Ct. 1409 (1970) p. 703. 28 Pierce v. Society of Sizlers [sic Sisters], 268 US 510, 69 LEd 1070, 45 Sct 571. 40 Meltzer v. Board of Public Instruction of Orange City, Fla., 45 L.W. 2434, (1977). 2. In the creationists' 'counter-evolution' chart, it says under Modern Man, "This genius thinks we came from monkeys." This is a complete misunderstanding of evolution. Humans did not come from monkeys, and this claim has been said to me several times, and no matter how many times I say it, it just doesn't sink in for some people. Humans are primates, just like apes and chimpanzees. Around 30 million years ago, the African primates diverged into two distinct groups, taking up different diets, habits habitats, as their environments changed and opportunities arose. One group developed into apes, which later included - mush later- chimpanzees, gorillas, and humans. The other group developed into monkeys, and DNA and other studies prove that we belong in the ape group instead of the money group. We did not come from monkeys but we are related to them; we share a common ancestor with chimpanzees, and before them, with the group that became monkeys. 3. They make the claim that dating fossils by dating the layer of earth they were found does not give accurate results, because "petrified trees are often found going through many of the layers. Some are even upside down running through millions of years worth of rock." This is a silly argument because the earth is not just a nonmoving rock, and things do not always happen slowly. Erosions, and floods, etc. can cause massive amounts of dirt, rock,and earth to move and cover things in a short period of time. Just because a tree is found lying in several layers of earth means nothing; even that it was 'upside down,' because what most likely happened was some traumatic event which uprooted trees, and shifted the ground, moving all the layers of earth. Besides, dating layers of earth which fossils are found in is just one day of dating. 4. They make the claim that the tailbone is not a vestigial organ because "nine muscles" attach to the tailbone. Just because a feature i vestigial does not mean that the evolutionary process cannot use that for some other purpose. 1. "Vestigial" does not mean an organ is useless. A vestige is a "trace or visible sign left by something lost or vanished" (G. & C. Merriam 1974, 769). Examples from biology include leg bones in snakes, eye remnants in blind cave fish (Yamamoto and Jeffery 2000), extra toe bones in horses, wing stubs on flightless birds and insects, and molars in vampire bats. Whether these organs have functions is irrelevant. They obviously do not have the function that we expect from such parts in other animals, for which creationists say the parts are "designed." Vestigial organs are evidence for evolution because we expect evolutionary changes to be imperfect as creatures evolve to adopt new niches. Creationism cannot explain vestigial organs. They are evidence against creationism if the creator follows a basic design principle that form follows function, as H. M. Morris himself expects (1974, 70). They are compatible with creation only if anything and everything is compatible with creation, making creationism useless and unscientific. 2. Some vestigial organs can be determined to be useless if experiments show that organisms with them survive no better than organisms without them. 5. 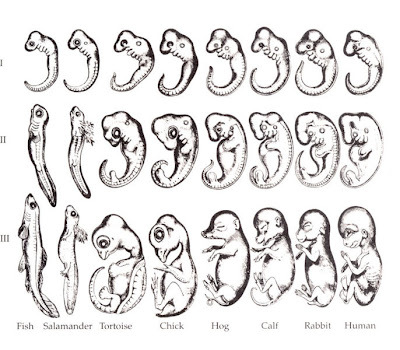 They claim that the similarities in embryos of different species does not prove evolution (specifically the "gill slits"), and that Haeckel faked his drawings. Vertebrate embryos universally have prominent structures in their neck region that are called by various names in the scientific literature: branchial, pharyngeal, or visceral pouches or grooves or furrows or arches. Because they may appear as a repeating series of slits in the neck of the embryo, resembling the pattern of repeated elements in the neck of adult fish, they have also been colloquially called "gill slits" or "gill pouches." They are not, however, gills - and scientists have not been claiming that they are (Wells even quotes several authors, Wolpert and Rager, who explicitly state this simple, obvious fact). So what are they? "Gill slits" are common structural elements of vertebrate craniofacial development. "Common" is the important term here. It turns out that all vertebrates build their face in the same, somewhat improbable and counterintuitive way; it is this deep similarity that is the root of the evolutionary argument that it reflects common ancestry. 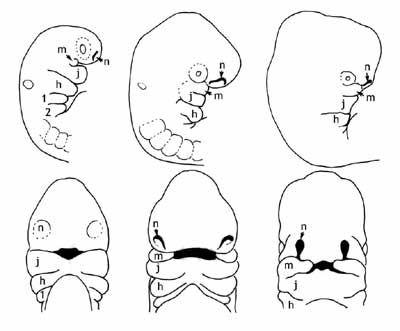 The head of all vertebrate embryos, whether they are a fish or a human, can be simply described as a curved tube largely made up of presumptive brain (Figure 2), with a series of 4 to 7 finger-like tissues hanging down from it, the pharyngeal arches. What we consider a face, everything from just below the eyes, back to the ears, and down to the neck, is absent. Instead, we have these dangling blobs, each of which will contain a cartilaginous rod, a column of muscle, a significant branch of the circulatory system, and an assortment of other cell types. These arches are reiterated modules that will subsequently merge and rearrange themselves (along with other cranial tissues, most importantly a migrating population of cells from the top of the head called the neural crest) to form the more familiar face. They do so in similar ways in all vertebrates: the first pharyngeal arch, for instance, always forms the jaw, and the second arch always forms the hyoid. There are also differences that emerge in different classes. Pieces of the first two arches find their way into bones of the mammalian ear. The third and subsequent arches in fish end up in the gills, while those same arches in a human form a series of cartilages in the throat. The third fuses with the hyoid, the fourth forms a major part of the thyroid cartilage, and the fifth forms the cricoid and arytenoid cartilages. Non-cartilaginous elements of these structures end up incorporated into all kinds of tissues, glands and muscles and epithelia, of the neck and face. This common pattern of development is a genuinely remarkable thing. It is one of the reasons that early evolutionary biologists, such as Charles Darwin, argued that the evidence of embryology was so important to his theory - we see such intricate processes redone over and over again in such similar ways in species after species. Given that the initial pharyngeal arches are radically rearranged over the course of development, there is no obvious reason why all vertebrate embryos begin with virtually identical structures that are equally remote from their final morphology, other than that they reflect a shared morphological foundation and a common ancestry. It is true that Haeckel did draw his pictures of embryos in a deceptive manner, making them look almost identical. I've seen his drawings (see below Figure 1) and those of more modern ones (Figure 2), and while they are very similar, Haeckel clearly embellished the similarities in his drawings. 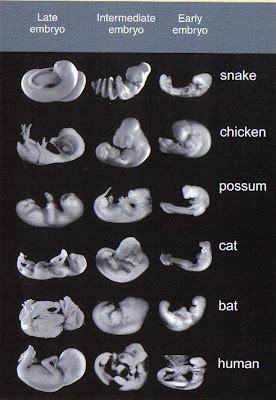 Yes, it was wrong for him to do that, but that doesn't change the fact that there are many striking similarities between embryos of different species. 5. The comic claims that the vestigial pelvis in whales doesn't prove evolution because "those bones serve as anchor points for muscles. Without them they cannot reproduce. They have nothing to do with walking on land." The comic also states, "Even if there were 'vestigical' organs, isn't losing something the opposite of evolution?" Again, just because something is "vestigial" doesn't mean it doesn't have a use that evolution has not taken advantage of at some later date. I'm not familiar with the use of a whales' vestigial pelvis, but according to Ardea Skybreak, in the book The Science of Evolution and the Myth of Creationism, says that whales' pelvis is "underdeveloped" and "apparently useless" and aren't even attached to other parts of their skeleton (pg. 104 in above mentioned book). So, I'm unsure about that claim about a whale's pelvis being crucial for reproduction, but according to my source, it's untrue. It might just be yet another lie by creationists to further their agenda. As for the loss of something being the opposite of evolution, that makes no sense, because, look at humans. We don't have the strength of the gorilla, the claws of other animals, nor the sharp teeth, but we did happen to develop a large, smart brain (well some of us anyway...). Mutations are random and each species, in a sense, makes due with what it has. If it survives, then natural selection carries on the trait to the next generation, and so on. There may be an answer out there as to why these whales lost their legs, but whatever the reason, it is not a blow to evolution.